After a substantial breakfast I took the car into the town to avoid the 15 minute walk but after driving around for 10 minutes looking for a park that decision was feeling counterproductive. However I found a parking building and managed to squeeze our small car into a park so tight I had to get out of the passengers side. With my, current, poor flexibility that was a challenge. 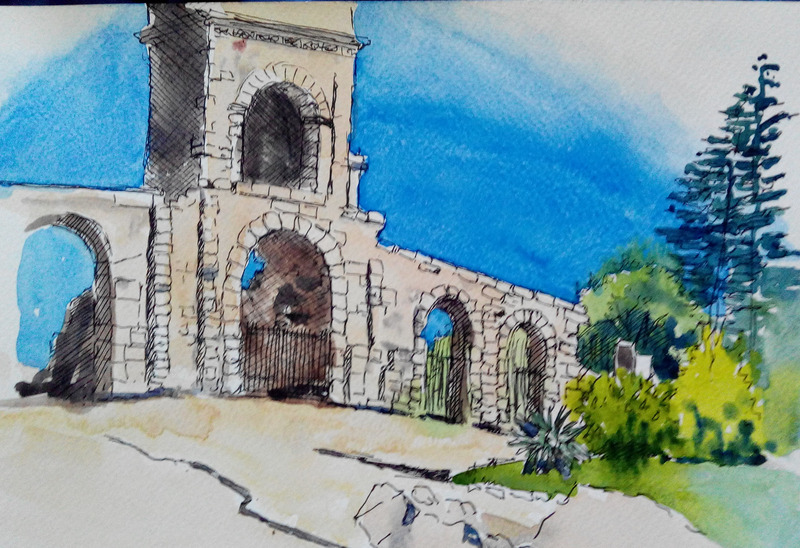 For about an hour and a half I sat in a garden and completed a pen & wash pic of the Roman theatre (as opposed to the arena). Mark met me at midday and we strolled across to the Musee Reattu which has a collection ranging from the 1600s through to Picasso who bequeathed 57 drawings and two paintings. The Picasso drawings were from about 1971 and were a pleasure to view. There was also an excellent photography exhibition showing. Lunch came after 2pm as usual then we split up again and I made a sketch of some pretty randomly placed buildings before meeting up again for a beer before heading back to the hotel. We have found a laundromat so we might get our washing done before tea. Laundry proved no problem and, fortunately, the laundrette was just beside a bar so we managed a couple of drinks while we were waiting. Mark used Trip advisor and discovered that the bistros just the other side of the laundromat from the bar was well recommended so we went there for dinner and got what was almost certainly the best meal we have had. Mark had the guinea fowl and I decided on a salad which came with a whole baked camembert. Dessert was a tiramisu for Mark and tart aux pommes for me. Did you really mean guinea towel or should that be fowl? Hope Rona can match that standard tomorrow night….will put in my orders. Exhibition sounds pretty cool, glad you got another gallery out of the system. Happy travels to you both as you head off in different directions….a nice cold snap waiting for you Quill. xo. love the artwork Quilliam, you seem to able to get a good subject anywhere, good food to hand is always a bonus!